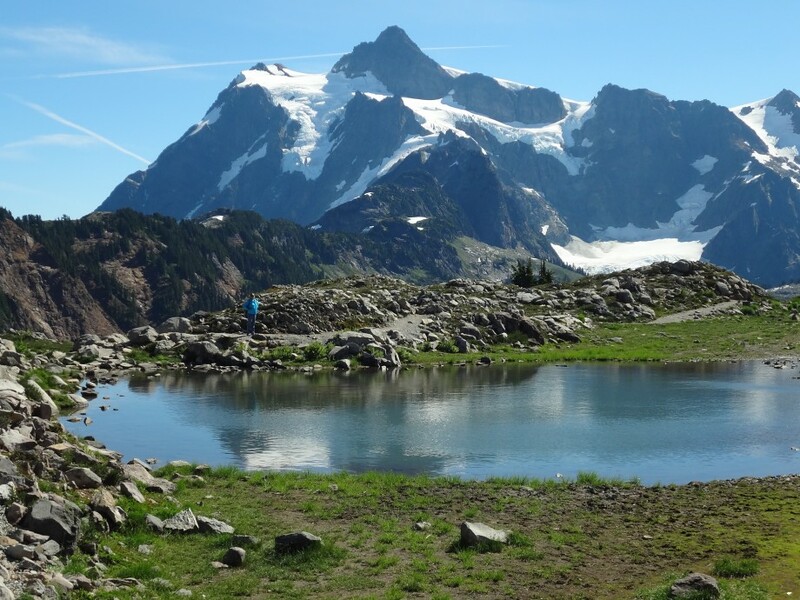 It’s June 1st and good weather is finally breaking out across the Pacific Northwest – time to go sea kayaking. So, we reserved a one and a half hour tour with Whidbey Kayaking Company at the boutique town of Langley on Whidbey Island hoping for sun, whales, seals and eagles. We were rewarded with everything except the gray whales which had migrated north a few weeks previous. We paddled out of the waterfront at Langley at 10 in the morning under a high overcast sky with a couple of the local harbor seals following us out of the marina watching us with their puppy-dog faces. Soon a pair of bald eagles floated by overhead with the usual crowd of crows harassing them as they soared away over Possession Sound. We paddled in glassy water past the beach community of Sandy Point and followed the shoreline for another ½ mile before turning around. The sun broke out, more seals checked us out and we leisurely paddled back towards Langley watching eagles guarding their nests in trees on the bluffs outside of Langley. Instead of the strenuous adventure battling currents, wind and kelp that we had expected, the trip turned out to be a relaxing float in the quiet of the morning surrounded by clear water, eagles and seals – pretty good way to spend Sunday morning. We turned in our kayaks, had lunch in Langley and drove back to Clinton on the southern end of Whidbey Island to take the ferry to Mukilteo and home but found the ferry line backed up all the way out of town. So, we pulled out of line and drove north across Whidbey Island as the overcast lifted and the Olympic Mountains to the west appeared, white with fresh snow shining in the early afternoon sun. 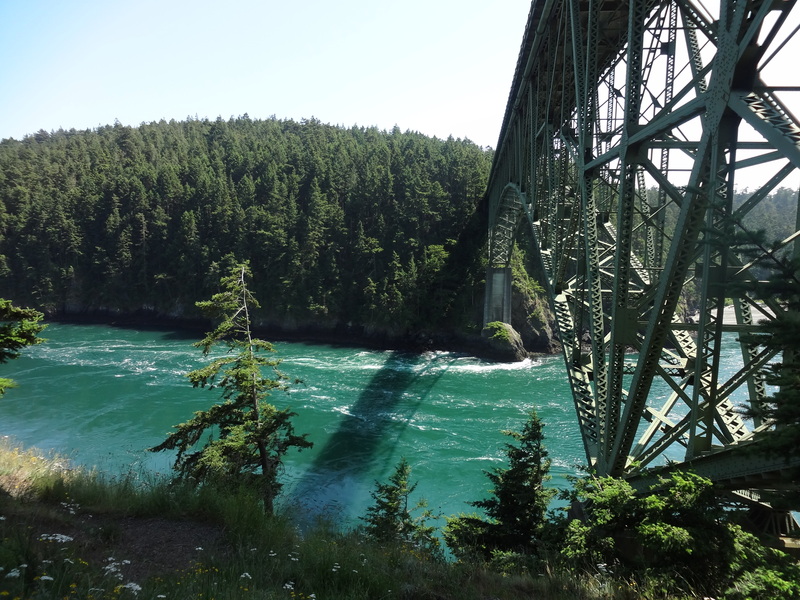 We stopped at dramatic Deception Pass, a narrow gorge at the far northern tip of Whidbey Island where a high bridge takes you over one of the most turbulent salt-water passages on the west coast. Since there was a minus tide this day (exceptionally low tide) the currents were particularly strong, pouring through the gorge with foam and whirlpools. Looking down from the bridge we noticed a harbor seal playing in the current, circling around an eddy formed where a sheer cliff plunged into the rushing waters. He seemed to be having a lot of fun rolling around and diving in and out of the rushing water. We watched him for half an hour or so before returning to the car, continuing on to I-5, and finally home. Yep, pretty good way to spend a Sunday afternoon.